Imagine calling your loved ones to announce your surprise engagement, only to find out that they had been involved in the plan! When Andrew Walter was orchestrating his romantic proposal, he not only respectfully asked Michelle McLoughlin’s parents for their blessing, but also enlisted the help of a neighbor with the details. While Andrew took Michelle to the opera downtown and then out to dinner, he had his neighbor fill their living room with three dozen roses along with a card that said “Will you marry me?” When they returned home to the scene, Michelle was completely surprised. She was thrilled to start spreading the big news, only to find out that her neighbors, her parents and her eleven-year-old sister, even her cousins, aunts and uncles already knew! They did, however, have some practice in keeping a secret. Although Michelle and Andrew work for the same company, they didn’t really know each other until they both attended a going-away party for a co-worker. A spark was lit, and they began dating a few months later. Somehow, they managed to keep their relationship a secret from virtually everyone at work until they were engaged, which was no easy task! Once their secret was out, Andrew and Michelle dove into wedding planning, with the search for the perfect location as their primary focus. They knew they found it when they arrived at the Serra Retreat in Malibu. The site suited all of their dreams, being different and memorable with its privacy, natural and beautiful setting, abundant flowers, ocean view and incredible Mediterranean architecture complete with hand made tile and tranquil fountains. Michelle and Andrew limited their guest list to only forty–three people, including themselves, one maid of honor, one junior bridesmaid and one best man. 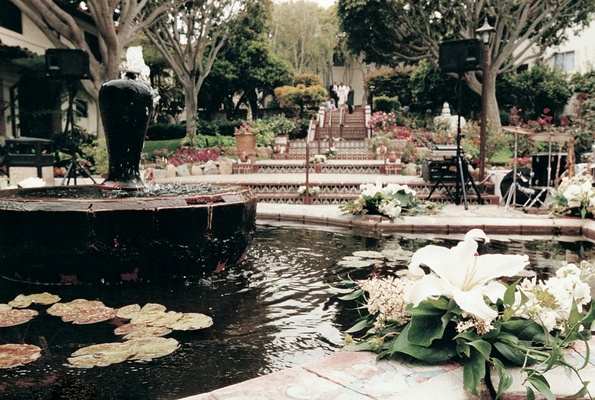 The size of the wedding is what Michelle considers to be its most unique feature. 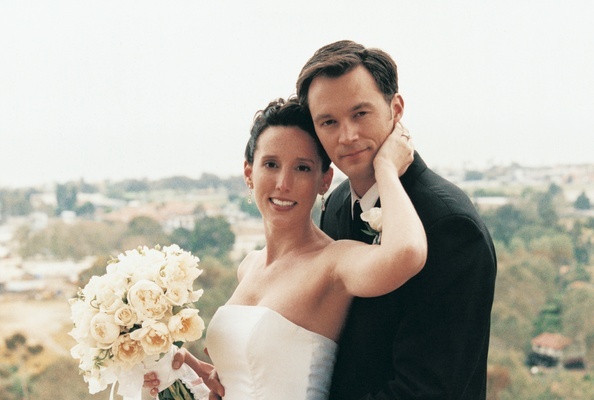 The size was perfect because it was big enough to give Michelle the wedding she always wanted yet small enough that it suited the intimate setting and maintained the focus on the celebration of marriage. The bride and groom loved the fact that they actually had a chance to talk to each of their guests during the evening, and that every person was there because they are someone truly special to them. 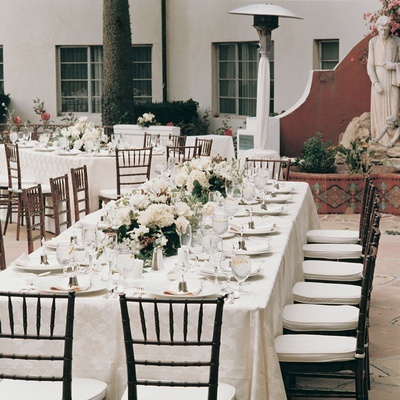 They decided on white floral décor since the Serra Retreat has so much color already with its bountiful flowers for the ceremony and reception. The ceremony gazebo was decked in white flowers and white chiffon swags. 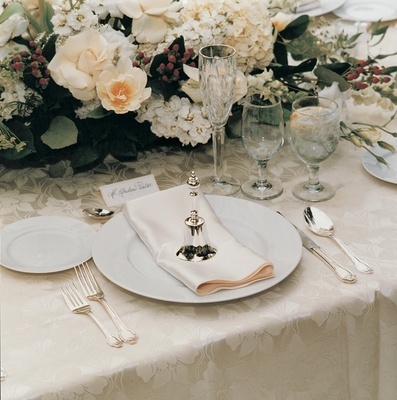 Rectangular dinner tables held white floral low centerpieces along with lots of white pillar candles. Because the cocktail hour was held in an area without as much natural foliage, they threw in more color there, using hues of blues and purples and lavenders. The couple was married at The Point, overlooking the ocean and mountains. The ceremony was performed by a close friend of the bride and groom, and contained several personal touches and meaningful readings. One of the readings was a touching poem by Percy Bysshe Shelley, titled “Love’s Philosophy”. A festive cocktail hour followed the ceremony, and then a formal dinner reception at The Lower Fountain. Guests enjoyed a six-course dinner which included spinach salad with caramelized pecans and gorgonzola, tomato bisque soup with parmesan toast, mango sorbet, choices of ravioli or swordfish or beef tenderloin served with vegetables. Chocolates and mints were served with coffee after dinner, along with the distinctive three-tiered wedding cake that was part lemon cake with lemon custard filling and part chocolate cake with chocolate mousse filling. 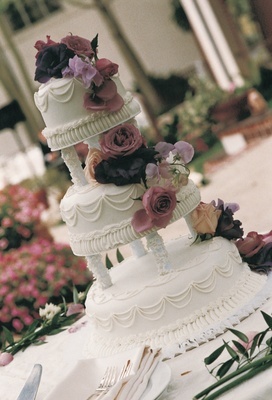 The white frosting was embellished with fresh flowers in shades of blue, lavender and purple. Cringing at the thought of typical wedding reception music like the chicken dance, Michelle and Andrew instead chose sophisticated tunes by greats such as Stan Getz, Erroll Garner and Ella Fitzgerald, played by a live band that included a grand piano brought in for the occasion. The swank romance of the music definitely fit Andrew’s surprise toast to his bride at cake cutting time. Not only did he get choked up himself, he also brought Michelle, their guests, and even the wedding coordinator to tears! That moment really crystallized the depth of Andrew’s love for Michelle and is one she will never forget. The blissful newlyweds are thankful that they paid so much attention to all the little details of their wedding, even down to adding flower arrangements to the powder room. The result was all they had hoped for: classy and elegant but in a simple way instead of being overdone. Michelle and Andrew are also pleased with their decision to hire a wedding planner, as it relieved the stress of the day and allowed them to enjoy themselves. In the end, they wish to remind other couples that are planning their weddings to not get so wrapped up in the wedding that they forget the meaning of their special day. A point well illustrated by such a wonderfully intimate wedding!